This is the first of what I’m planning to be a short series of posts about the Digital Humanities Summer Institute (DHSI) at the University of Victoria. The goal here is to recap some tools for digital humanities research, and particularly to think about how we might incorporate these into teaching. DHSI wrapped up last Friday, with the end of the third week of classes, and since I attended the second and third week, I have not one, but two courses to write about here. The first course I took was 3D Modeling with John Bonnett of Brock University. Part of Bonnett’s work includes recreating models of historic Canadian buildings, and our task for the week was to replicate a historic structure in downtown Victoria using SketchUp, a 3D modeling program. 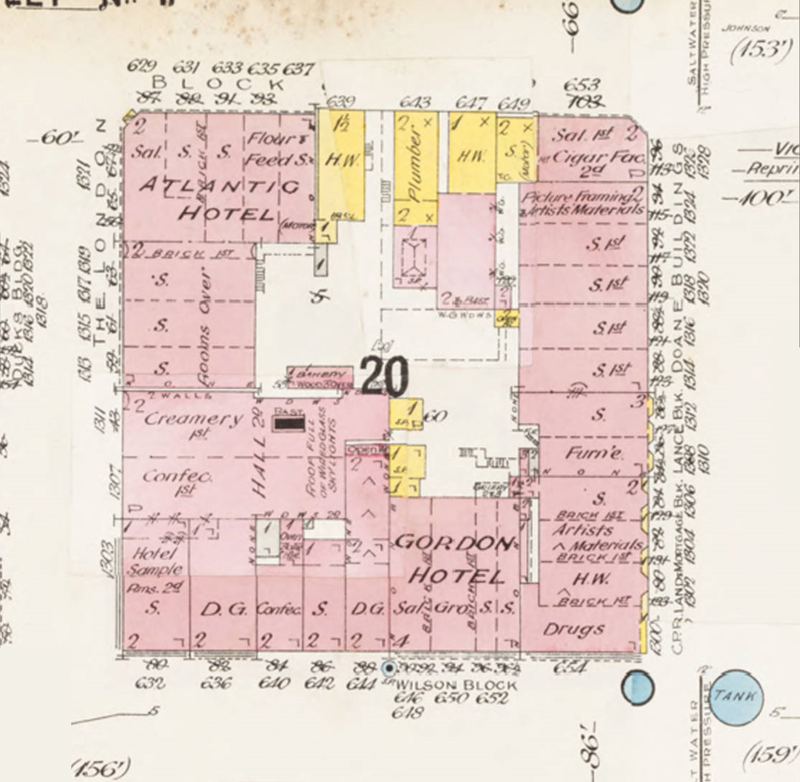 For reference, we used Sanborn fire insurance maps, historic photographs, and site visits, since the building in downtown Victoria was just a short bus ride away. Sanborn map of downtown Victoria. Source: University of Victoria Digital Collections. Using the Sanborn maps and photographs, we were able to take measurements of the building’s footprint and exterior elements. 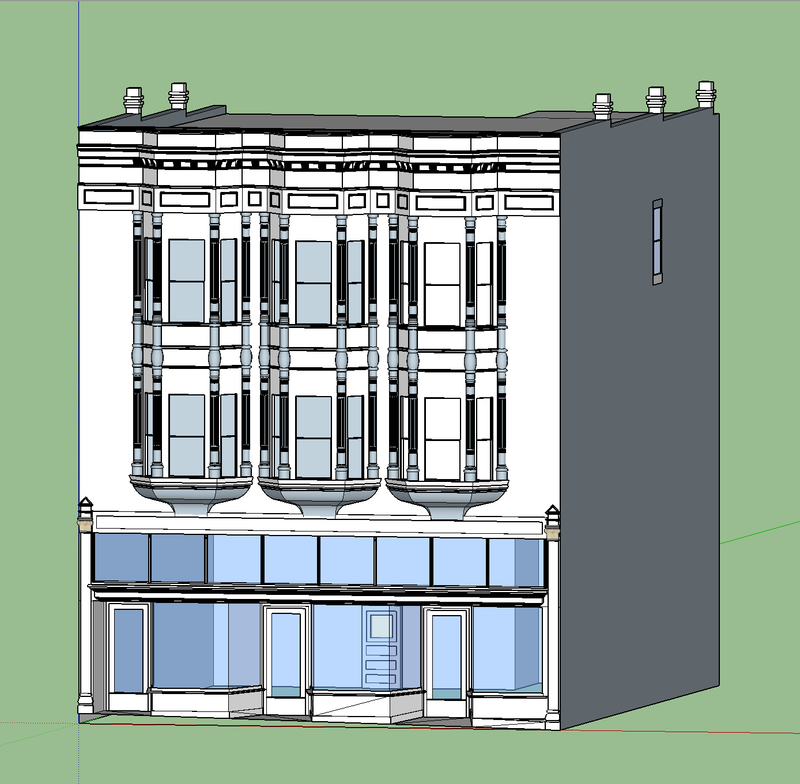 With the Sanborn map as a base for the building, we extruded a solid volume to the height listed on the diagram, and stretched an image of the building onto the volume to record the proportions of the building’s exterior elements using Sketchup’s measuring tape tool. (A full description of this process would be too long to include here, but tutorials on adding photos to faces and stretching photos over faces in SketchUp are available on YouTube.) 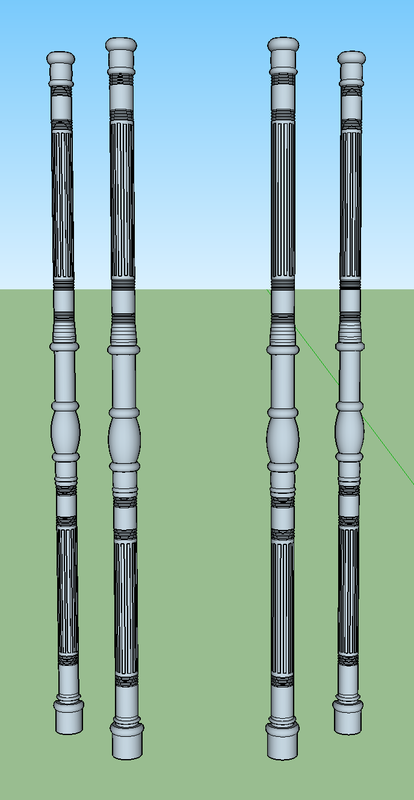 One of our classmates, Jon Breitenbucher, took a slightly different approach, using Photoshop to precisely measure the columns around the second and third story windows, which he recreated beautifully. 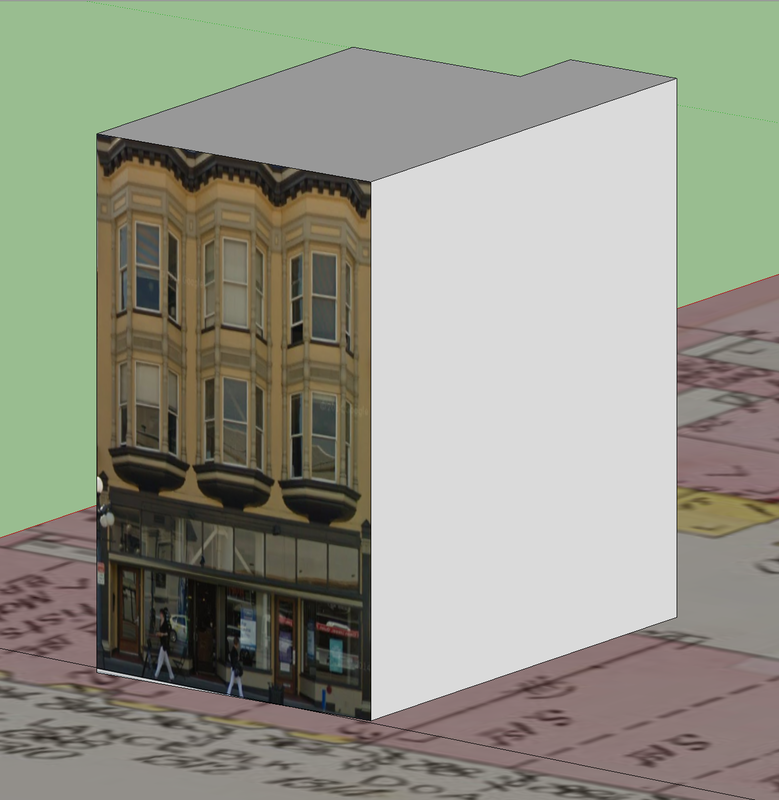 Building volume from Sanborn map, with stretched front facade. We worked individually and in small groups on different architectural features, and put them together for the final model that we displayed during lunch on Friday. Our final rendering of the building on Douglas Street. During the course, we also talked about using SketchUp in the classroom, and our own project served as a kind of microcosm for how that might work. Obviously the program can be used to produce impressive models of past and present structures, but how do we ensure that our teaching with SketchUp keeps key humanities skills in frame? One approach would include having students research and find the primary sources they’ll need, whether they be Sanborn maps, blueprints, drawings, or historic photographs. For classes working on recreating local structures, site visits may also be useful. This kind of project can also teach students important lessons about reading and primary interpreting sources. The Sanborn maps in particular use their own visual rhetoric, which students will need to understand in order to interpret them effectively. 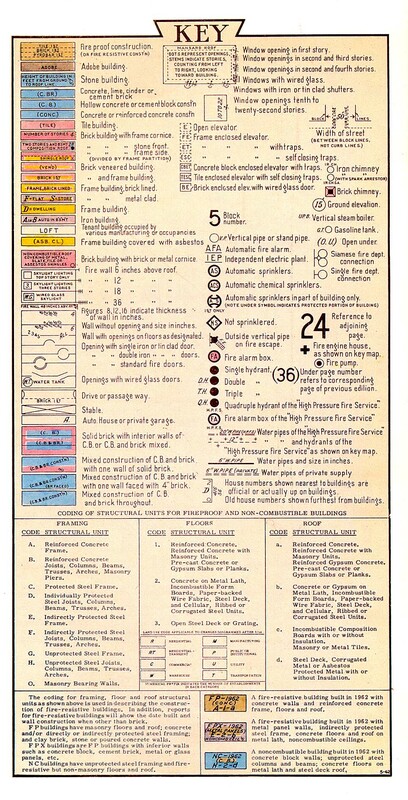 For example, where the maps list vertical measurements, these refer to the height of vertical walls, and may not include other elements placed higher up. It is also worth discussing the original purpose of the maps, the worldview they encode, and what parts of the built environment they may leave out. The takeaway here is that primary sources are not perfectly transparent, and reading them to reconstruct a picture of the past requires a knowledge of their context, authorship, and conventions. Sanborn Map Key. Source: UCLA Library. There are a number of notable existing projects that use 3D modeling to recreate the built environment of the past. Bryan Carter’s Virtual Harlem was an early entry into the field in the late 1990s, and is due for a relaunch later this year that will be compatible with both web browsers and the Oculus Rift virtual reality headset. Meanwhile, Justin Underhill, a digital humanities postdoctoral fellow at USC, is using digital reconstructions of architectural spaces to imagine how viewers encountered artwork in the past. In my own city of Philadelphia, I can imagine reconstructing parts of the Black Bottom neighborhood at midcentury, before it was displaced by federal urban renewal. A 3D Black Bottom might be combined with augmented reality, such that visitors and residents of the West Philadelphia neighborhood could hold up their smartphone or tablet to see what the landscape looked like in decades past. Of course, for a neighborhood that has been so thoroughly shaped by racist housing and urban planning policy, such a project would raise complicated questions about the ethics of spectatorship across lines of race and class. But again, such questions would be useful in helping students think more critically about digital humanities tools and their applications. If you’re new to SketchUp, there are some excellent video tutorials on the program’s website, which its basic tools. You may also want to check out the program’s Extension Warehouse, which features plugins developed by third-party users to make SketchUp more function. Material culture specialists may also be interested in photogrammetry software, which uses a series of photographs to reconstruct a 3D model of an object. 123D Catch, which is available for Android and Apple products (as well as PC desktops), allows you to do just this using a smartphone or tablet. Finally, the DH 101: Intro to Digital Humanities course website from the UCLA Center for the Digital Humanities has a lesson page on “Modeling Virtual Space,” complete with readings and exercises.